Participants are expected to be in excellent physical condition, to enjoy hiking, and be tolerant of altitude, weather, and uncertainty. No technical climbing or outdoor experience is required. Trek is rated as moderately difficult. Chitwan Jungle Safari, Nepal, or Bangkok/Ayudhaya, Thailand. Please inquire about optional 2 night/3 day extensions in Nepal or Thailand. Bed and breakfast plan (double occupancy) in Lhasa and Kathmandu, Tibetan leader/guide, sightseeing services in Tibet and Kathmandu, special dinner in Lhasa and Kathmandu, monastery entry fees, airport transfers in Kathmandu and Tibet, Tibet visa fee. The plane from Kathmandu pierces the clouds and slices between Mt. Everest and Kangchenjunga on its way to Lhasa. During four days in Lhasa, you'll acclimatize to these lofty heights and tour the breath-taking summer and winter palaces (the Potala) of His Holiness the Dalai Lama, and join Tibetan worshippers inside the massive butter-lamp lit Jokhang Temple. Visit a nunnery and the historic monasteries of Lhasa Valley, join new friends for a traditional Tibetan feast, and stroll the back lanes of Lhasa where Khampa warriors and reincarnate lamas stroll. Tibetans earn merit toward a better next life by doing kora (circumambulating a holy place) and visiting sites where their beloved Guru Rinpoche once meditated. 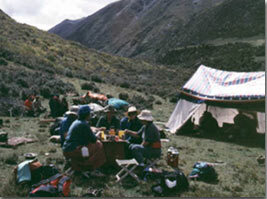 Join local pilgrims on the Ganden Monastery kora, high above the Kichu River Valley, before embarking on the trek. From the farming valley of Gyama, you'll climb gradually to Tseb La (17,000') and Kampa La (16,450'). Camping invites evening sightings of wildlife (giant marmots, mountain ungulates) and the starriest clearest skies imaginable. Over the pass, you'll enter a valley of roses and pass by countless holy sites, meditation caves and ancient chortens (stupas) following centuries of pilgrims' footsteps. The trek ends at Samye Monastery, Tibet's first monastery, recently restored in full grandeur. Finally, a trip to the "Valley of the Kings" - the cradle of Tibetan civilization. Fly back to Kathmandu. Day 4 Kathmandu: Stroll Bhaktapur's medieval cobbled lanes and palaces. Jokhang Temple, a nunnery, Drepung Monastery, and time to stroll the Barkor. Tibetan dinner with friends. Overnight Shambhala Hotel. Day 11 Continue gradually, hiking through fragrant dwarf rhododendron and juniper. Magnificent views unfold. Camp close to 15,800'. Day 13 End Trek at Samye: Descend through vales of flowers and rushing streams. Visit meditation caves. Cross the dry plains to Samye, its chortens gleaming from a distance. Overnight in guesthouse. Day 14 Samye Monastery: Visit monastery compound. 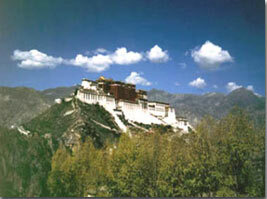 Drive to Yarlung Valley, "Valley of the Kings" and Yumbulakhang, the oldest building in Tibet. Overnight in hotel in Tsetang or near airport. Day 15 Early morning flight to Kathmandu: Free time in Kathmandu.